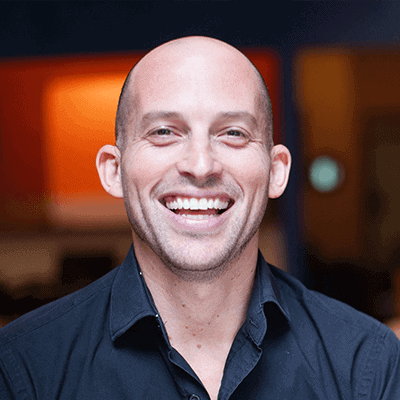 This guest post is by Conrad O'Connell of 91Digital, a digital marketing consultant with a focus on SEO, PPC, and email marketing. Conrad's super complete post below reveals the "long tail" treasures that big listing sites aren't ever likely to explore. This post is in conjunction with Conrad's previous post "Will I Ever Rank?" As we have covered before (and it seems to be of great interest), SEO is a great marketing channel for driving traffic to your vacation rental website. As many seasoned vacation rental owners know, SEO can be complex and competitive: that makes it often an unattractive marketing channel to spend lots of your time in when you aren't sure the reward you'll see (traffic + bookings) on the other end of all that effort. But, today, I want to show you research tips that allow for you to create pages that drive you traffic from destination research that don't take a lot of time to produce nor are they highly competitive search terms. While these aren't the broad vacation rental search terms that can often drive the most bookings (those are swarmed by the big companies), "long tail" keywords -- or key phrases that are between 2-5 words used to search for something specific -- are excellent keywords to generate traffic. In fact, they are pretty much tailor made for the independent owner or manager. Guests love to research your destination before booking their travel -- the more traffic you can drive at the top of the funnel, the more chances to convert that traffic into bookings down the road. Accordingly, the more elaborate their search phrase, the more targeted their interest is likely to be. When you think of your competitors, it's likely you're thinking of similar rentals or property managers in your area. For the purposes of this research, this probably isn't who we're going to be focusing on. Instead, we're going to research websites in your destination that write lots of content and rank well in Google for lower volume search keywords. You'll probably be researching websites like travel blogs, local chamber websites and other types of accommodations websites (could be a hotel website or a larger site like TripAdvisor). We're going to use a tool called Semrush (my [review here]) to do our research today. While there is a free version, it is quite limited in scope and to get the full benefit, the paid version will likely serve you best. While not required (could do a lot of this page research manually searching for opportunities), using a tool like Semrush or Ahrefs to plugin in websites and nag their top pages is a lot quicker with these tools. For the purposes of this post, I'll highlight Fort Myers Beach, Florida. A mid-sized market in Florida, Fort Myers projects as a good sample perhaps to the average vacation rental market in the US. 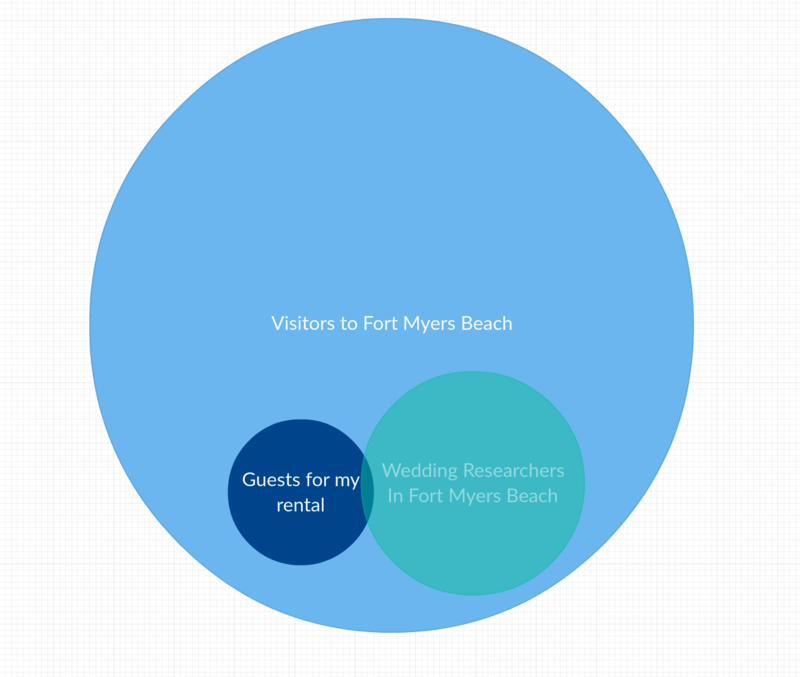 The average number of people searching for vacation rentals in Fort Myers is around 2,500 per month (this does peak during July to around 5,000 searches per month) -- therefore this example should represent the average sized vacation rental market. Note: I don't have any clients nor connections in the area, this was chosen at random. Starting our research, we're not worried about VRBO or HomeAway -- in general, these websites, while having a massive footprint in the vacation rental search keywords, don't often create content around destination research terms. While all of the large vacation rental listing sites have blogs, they're often scattered content that's trying to appeal to anyone visiting their website. HomeAway doesn't produce in-depth content about each destination but instead relies on creating very broad content and including popular destinations in each post. Lucky for us, while we do indeed have to compete on this content we'll be creating, long tail keywords represent one area where you don't have to worry about the large listings sites beating you to the punch. Good news! I typically like to start just by searching the name of the destination on Google. You'll likely find at least 2-3 sites that are dedicated just to your area ranking well in Google for these high-search volume terms. Our first local website ranking is https://www.fortmyers-sanibel.com, a tourism promotion website by the Lee County Visitor & Convention Bureau that covers both Sanibel Island and Fort Myers Beach. This is perfect for our research purposes! Websites run by your local chamber promoting tourism often have been around for a long time, have produced lots of content over the years and often aren't very commercially-driven. Their aim is most commonly to help convince researching visitors to your area that there's plenty of fun things to do, places to eat and accommodations for their upcoming trip. Before even using any SEO tools, I always like to review the navigation of any site that I am hoping to find blog post and content ideas from. Generally speaking, the navigation (or top menu) represents the top categories that you may want to address on your own vacation rental website. At the minimum, it gives you several topic ideas where you can start to research areas of interest to produce content around. While you would think you have a good handle on what your guests are looking for, I'm often surprised by how we'll find brand-new business types or areas of interest that you may not be aware of. While you may enjoy the destination your vacation rentals are in for various reasons, there's probably a whole different reason that your guests want to visit - a quick refresher into why others may visit is a helpful exercise to get your creative mind working and new ideas flowing. Let's begin with the very first menu item: Explore The Water. This drop-down menu exposes several areas where we can create topical hubs of content around. The sub-category items are: Beaches, Shelling, Boating, Kayaking and Fishing. What Shells Can You Find in Fort Myers Beach? Each of these posts may not drive lots of traffic, even when ranking highly in Google. But, the majority of these posts are easy to write, don't have VRBO or HomeAway going after the same keywords and can bring a researching guest onto your website. When you're building content on your site to help bring in long-tail search visitors, quantity can be your friend. One post may not drive you guests day after day, but a bank of 50 posts will help bring thousands of visitors to your website over the course of a year. This is the essence of long tail SEO. Now let's kick our research up a notch with a page report from Semrush. Using our sample website, let's drop it into Semrush and go to the Pages report. The Pages Report is rather hidden in Semrush - I have no idea why because I think it's actually a great source of information about a website. When viewing this report, we're going to sort by keywords not traffic. I like to see which pages likely have the most amount of researching guests visiting them, that's where we can find the long-tail opportunities. 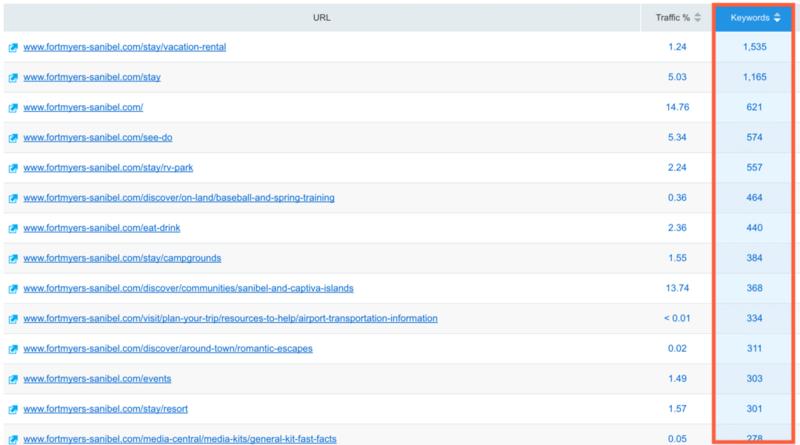 As you can see, some of the top pages for this website don't just have 2-3 keywords driving traffic. Some pages have over 1,000+ keywords helping get more organic visitors to the page! The average blog post ranking well in Google doesn't just get traffic from a single term -- it can often get traffic from at least a dozen variations or very similar terms that each may have 20-50 searches per month. Adding them up, you can see how a 'little' long tail blog post can actually get thousands of visitors from Google organic search over time. Now let's dig for our opportunities. Because the Fort Myers Chamber website has a subfolder for /stay/, a directory for all of their pages on lodging, we're just going to exclude that for now. While this is of course core to our business of vacation rentals, we're not looking for these keyword opportunities today. Note: it's possible that the website you're looking at for your destination has something similar -- a folder for accommodations or vacation rentals. While the actual term of course will vary from website to website, the idea is still valid when reviewing the majority of websites. Searching this report for good opportunities can take some time. You want to nail down specifically what types of content that you want to write about as well as making sure that the guests that would read your content are a good fit for your rentals. After all, if you have a small two bedroom condo, content about large family reunions in your destination likely won't be attracting the right type of researching guest. Adjust to your needs! This page ranks for 269 keywords in Google according to Semrush and likely drives around 200-1,000 visitors per month to the Fort Myers/Sanibel website. That for me qualifies as a great traffic opportunity as well as an area that would match well with guests that could fit into our rentals. Not every guest who visits your destination is a good fit for you -- perhaps their budget is low, they need a larger (or smaller place), the location is wrong or the dates they want are booked. Lots of variables come into play. However, if you can start to find pockets of researching guests and match your rental with those people, you can use this blog content to drive bookings. Creating your own guide to weddings in Fort Myers would be fairly simple -- you can have a section on wedding venues, beach weddings, photographers, dress shops and every topic around wedding planning. In my opinion, the Fort Myers/Sanibel website doesn't do a great job of addressing the need of the searcher: while they have some good offshoot topics/blog posts (where to propose in Sanibel Island & a bachelorette weekend), lots of questions may go unanswered after looking at the above page. Despite the high ranking in Google, it's a pretty 'thin' page. Creating a '10x' piece of content about weddings in this destination would be a very attainable project even without lots of resources. Just taking the time to write out all of the details about a wedding would make your page lots of useful to a guest than their page. For example, most of the pages ranking in Google for the wedding query are commercial sites selling packages or venues. In the framework of 'Help don't sell', your content could address the many gaps and create a one-page view of all the related wedding information for brides-to-be to have. After you have created your content, working to get it more traffic can actually be pretty simple: help out others & ask for a link back to your content. Above I mentioned that it would be helpful to link to any wedding photographers, venues or wedding vendors. Why would you do this? Generate goodwill and earn it back with a link to your site. After publishing the your wedding guide in the example above, you could then email each and every business and vendor that you linked to and promote your content. It's a great way to get social activity on your posts (ask them to share and tag you on Facebook) as well as perhaps get a link back to your website. When you email every vendor you mention and link to let them know a little more about your business: you provide vacation rentals to guests coming into your destination who are planning weddings and would love to share more about their business with your guests. Ask them if they have a page about lodging or accommodations that you could fit on -- often times you can drive traffic back from links on other local vendor websites and it helps build authority in the eyes of Google. A deeper guide on referral traffic and link building for vacation rental managers can be found on my site over here﻿. Websites in Google are ranked off three main areas: on-page (technical), content and links. For most vacation rental websites run by managers and owners, they’re doing (1) a decent job with on-page SEO, (2) a poor job with content and, (3) no effort is being placed into generating quality links to their site. To rank well, it takes all three. However, Google today is far smarter than Google of even 2-3 years ago. Where it used to be that large “[content farms]” could write content about anything to rank well, that’s changing. Ideally, Google wants to solve the answers to the questions that users are putting in. This means that you are the best possible information source out there for any of the topics above. This is a very attainable goal for the anyone who’s willing to put in the time and effort needed to create this content. Think of it this way: the big listing sites don’t have the time (or bandwidth) to create in-depth, local, detailed information about each destination they are offering rentals in. You only need to create in-depth, local, detailed information about each destination and you are in. The path is clear and you can execute this strategy to earn more organic traffic. Kayaking Fort Myers - great way to target a 'things to do' keyword with a specific activity. Depending on your destination, research other common outdoor activities and you're bound to find a winner for a content page. Shopping In Fort Myers - guests looking for shopping want to spend - let's make sure they find your vacation rental website by creating a guide of malls, local shopping spots and more. Night Fishing In Fort Myers - looking for something fun, this specific blog post idea has a few pages ranking well, but very few address the topic directly. You can do better - email local Captains and ask for advice that you can write up into a blog post targeting this term. You get the gist at this point -- creating content for your vacation rental website doesn't have to be hard. It can actually be fun! It just takes some time to research websites in your area, filter to find good topics that your guests are interested in and producing the content. These pages will help drive more traffic from Google organic search, earn you more leads and help you drive more direct bookings. Questions? As always, I'm in the comments below to help.